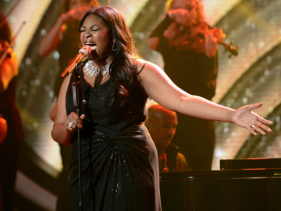 Candice Glover closed out an emotional episode of "American Idol" on Wednesday, stealing the show with a bombastic rendition of the "West Side Story" staple "Somewhere." "Candice, you didn't win the round with that song; you won the night," mentor Jimmy Iovine said at the close of the show, which found Glover, Kree Harrison and Angie Miller battling for a trip to next week's final. The judges were just as enthusiastic, with Randy Jackson calling Glover's performance "a singing lesson" and Keith Urban declaring, "If you don't want to vote for Candice, call your doctor; you probably don't have a pulse." Wednesday's episode showed highlights of the three finalists' visits to their hometowns, which were predictably moving and rife with tearjerker moments. The three finalists were also asked to sing three songs apiece: One chosen by Iovine, one from the judges and one from the show's producers. Somewhere" followed her earlier performances of Emeli Sande's "Next to Me" (the judges' pick) and U2's "One" (Iovine's pick). Glover admitted she had never heard "One" before she was asked to sing it, but she was praised for her emotional connection to the song and its lyrics. And "Next to Me" showed viewers "how you can be in the modern world on the charts today," Jackson said. Added Mariah Carey, "I can't see anything but very, very good things happening for you in your future." Angie Miller garnered some of her best reviews of the season for her three songs, Elton John's "Sorry Seems to be the Hardest Word" (Iovine's pick), Pink's "Try" (judge's pick) and Emeli Sande's "Maybe" (producers' pick). Several judges commented how comfortable she was during "Try," and Miller said she felt "refocused" after her visit home. After "Maybe," Randy Jackson said Miller finally "became a complete performer," and Urban agreed she was "finding her groove." "You've become what we've been preaching about," Minaj told her, adding her growth over the course of the season exceeded her own expectations. Harrison opened the show with Pink's "Perfect" and later sang the Band Perry's "Better Dig Two," both of which were criticized for being outside of her comfort zone (even though none of the song choices were hers). But her middle song, Rascal Flatts' "Here Comes Goodbye," was right in her wheelhouse and became her most celebrated performance in weeks. "You sang it like a pro," Minaj told her. "This was one of your best performances to date, because you felt every word." On Thursday's episode, one of the three ladies will be sent home, and the first all-female finale since Diana DeGarmo went head-to-head with Fantasia Barrino in season three will be set into motion.